A handheld massagers are excellent if you want to be in control of your massage. There are a lot out there, but two of the best are the Homedics HHP-350 and the Pure Wave CM7. This review is aimed to help you understand that while it's a great massager with outstanding performance and results, and it's offered at a good price, the Pure-Wave CM7 wins the crown. It's simply a better all-around massager. Here's how their benefits and features stack up head to head and why the CM7 from Pure-Wave comes out on top. There's no doubt that this handheld percussion massager is a good buy. A step up from the lesser vibrational massager HHP-250, which works well as a cellulite massager, it has two heads that pivot and the percussion massage it delivers is outstanding for your entire body. It's seriously soothing and therapeutic. If you have a hard workout, and your muscles are sore and tight, come home, plug it in, and in seconds, you can be working out the knots and stiffness in your legs, arms, back, shoulders, or wherever you feel it. There are a lot of great features in this little package, but the standouts are handle design, percussion massage, and the optional heat. The handle on this massager is well thought out, which gives it a leg up. Many handheld massagers just have a bar-type single handle, but this one has a true triangle handles that you can easily hold on to and maneuver because it's designed well and with intention. It's ergonomically effective and usefully practical. While many hand-held units claim this, you'd be surprised by how many are hard to hold, too heavy, or just unwieldy. You don't want to be massaging your back or shoulder and have the whole thing slip out of your hands. That defeats the purpose. The HHP-350 has three levels of intensity, for the percussion, and you can swap out the head attachments to go from firm to gentle in intensity. The percussion works to go deep into your muscles and soft tissue. So, if you have a knot behind your shoulder blade or in your neck, for example, you can get the heads right on the area, and the percussion will press out the tension and pain. You'll feel both meltaway, especially if you get into a good position on a couch or chair and let it work its magic. The addition of heat works very well in combination with the deep penetrating massage heads. The heat loosens up whatever stiffness you have and increases the blood flowing through the area. So, your tight, sore muscles can be smoothed out quickly. And this also helps muscles to recover faster. So, if you're using this for post-workout relief, you'll have a quicker recovery time. The heat is also good to use on the back of your neck if you have stiffness or suffer from headaches. It’s customizable. You can change the heads and vary the intensity for a deep, powerful massage that works out stress and soreness, or opt for a gentler massage, geared towards relaxation and the reduction of stress. It works incredibly well in both capacities and those in between. Power. This powerful unit really packs a punch for a handheld. Due to the fact that it’s corded, you get the power that battery-operated massagers can’t deliver. Not only do you get the option of adding heat, but you can also turn it on or off with a button press, so you can turn it on and off throughout the massage as opposed to just on or off for the entire session. It isn’t cordless. The payoff here is, of course, you get a more powerful massager, but the fact that you have to be near a power plug makes it less convenient and portable. Attachments. It’s awesome to get the variability that comes with changing out the massage heads, but it isn’t a seamless convenience. You do have to stop what you’re doing and take the time to readjust with each selection. Something a bit more automated or controlled via a slider or switch would be more elegant. Power. While this works to your advantage when working out a tough knot or decompressing from a workout, it makes it a challenge to hang on to. The ergonomic handle definitely comes in handy in that regard. But just be warned that you have to hang on with a firm grip when you have the power turned up to 11. With all the excellent features and benefits of the Homedics HP-350, you have to really up the standard to outrank it. And the CM7 does just that. What makes it so great? In short, it's versatile and cordless. It's two massagers in one, really. It's a powerful massager that relieves muscle and joint pain and the aches and tightness that come from working out or a stressful day at work (or let's face it, life). And it's also a face and body massager. Oh, and it's small, light, and cordless, making it extremely easy to toss into your gym bag or carryon luggage. Bonus points for needing to be nowhere near a plug for some fast relief. Whether you're an athlete looking for a massage to speed recovery shows just 10 minutes of massage is all you need), or a busy traveler who can use a stress-relieving break whenever possible, you will more than happy with the power, massage types (deep tissue and acupressure), and ease of use. It's small and light, and the attachments, known as sticks, make working deep into the muscle and soft tissue an absolute dream. You know that one massage therapist that's always booked and impossible to get in to see because of her strength and ability to work out those ridiculously tight muscles? The point sticks are the best possible substitute, and you never need an appointment. They're incredibly effective on working out tight areas that benefit from direct, targeted pressing of the deep tissue and muscle. This is therapist-grade targeted massage pain relief. And the facial stick attachment delivers vibrational massage, which is ideal for keeping your face toned and tight. Face massage is tricky, but when done right it can keep you looking younger and healthier for many years. The CM7 facial stick does it well. 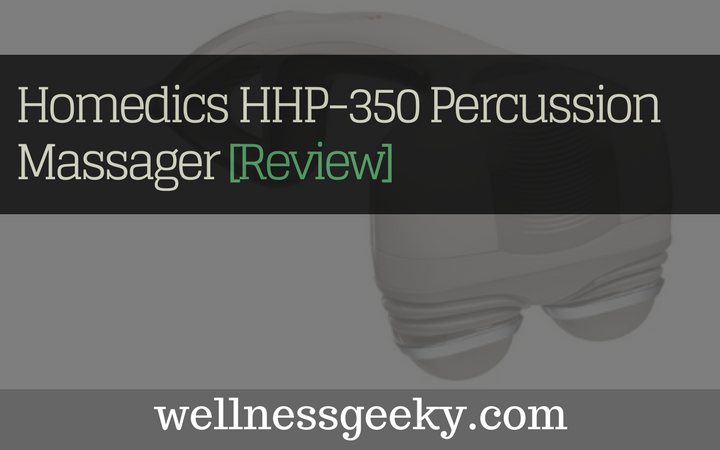 The HHP-350 is a powerful home hand-held massager. The percussion technology works wonders for relieving stress and pain, and you really can feel it working throughout your entire body. The design is sound and with it you can easily reach all the tight, sore muscles on your body. It's great for after a workout, and you will notice you recover much more quickly so you'll be ready to hit the gym again the next day. The Pure-Wave CM7, however, comes out ahead due to it's small, portable size and weight, and its versatility. It's mighty powerful for a cordless unit, and with the stick attachments, you get an excellent facial massager to boot.